Colin was born on a Canadian Military Base in 1953, a prairie boy. At the ripe old age of 20 years, he began his career with the Edmonton Police Department. Quickly determining that for him, it was likely better to work with machines than people, he started his helicopter license in 1978. Joining the Royal Canadian Mounted Police as a helicopter pilot in 1981, he travelled into every province, was personally involved with many of the significant events of that time, and flew a variety of helicopters and fixed-wing aircraft throughout his 20-year career. 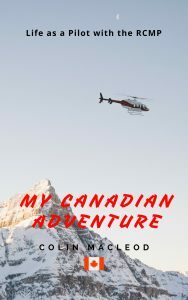 His first book, “My Canadian Adventure” is from a pilot’s point of view and chronicles those years in the RCMP from 1981 to 2001. Told from the perspective of the cockpit, with humour and compassion, this story details mountain rescues, mass murders, tragic accidents, body hunts, native uprisings, drug busts, family trauma, and much, much more. A very personal story, this book is an intriguing, interesting read, providing a unique point of view on this period in Canada’s history.